Yay! It's Open Studio time again! Marblers can join me in my studio on Saturday, April 11 and Sunday, April 12 from 10 a.m. to 4 p.m.
First Open Studio of 2014 ~ Spring Classes Announced Soon! Let's welcome in 2014 together in the marbling studio! Students or anyone with prior marbling experience can join me for Open Studio on Saturday, February 15 and Sunday, February 16 from 9 a.m. to 5 p.m.
Open Studio is great for those who want to continue to practice marbling but who may not have the space to set up their own studio. Or maybe you want to test out a new tank size! I'll have the large tanks (20"x25") available as well as medium tanks (11"x14") and small tanks (5"x7"). While I don't teach during this time, I am in the studio to answer any questions. For more information about Open Studio, click here. To sign up, send me an email (Cheers "at" BarbSkoog "dot" com) with the date(s), time frame, and tank size you want to work in. I will also be posting a spring class schedule in early February, with classes beginning late March. I will be offering my three-hour Experience the Tank class, the five-hour Beginning Marbling class, and the two-day Introduction to Marbling class (which will only be offered once this year). 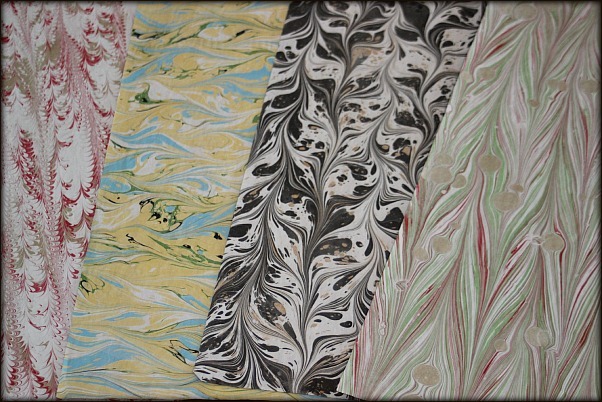 I am also in the process of developing a one-day FABRIC marbling class, which will be offered in April! Sign up for my eNewsletter to be the first to know when the schedule will be announced. November Open Studio ~ with a Twist! November Open Studio Saturday, November 16 from 9 a.m. to 4 p.m. Sunday, November 17 from 9 a.m. to 4 p.m. 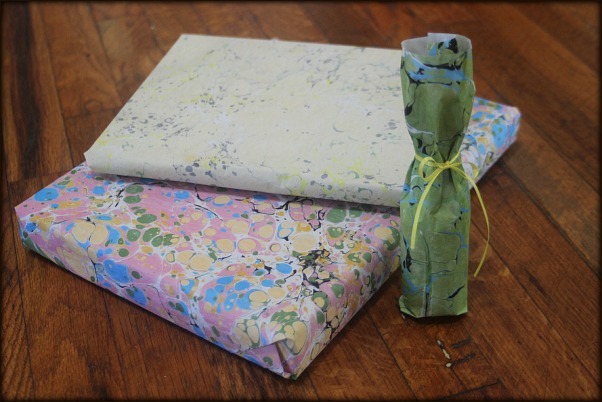 I'm excited to offer a little something special for this month's Open Studio ~ the option to make your own marbled wrapping paper and gift tags! If you would like to make your own unique wrapping paper and gift tags for the holiday season, birthdays, hostess gifts, baby showers, or any other celebratory event, I'll have pre-alummed, recycled newsprint and kraft paper gift tags available for you to marble on. Because the newsprint is thinner than most regular papers, it is ideal for wrapping...however, it is a little tricky to work with so I will also provide some tips and assistance during your session. All the extra effort will be worth it though...you'll LOVE the end results! Only the large marbling tanks (20" x 25") will be used for the newsprint. Newsprint is approximately 18" x 24". Two gift tags will be provided with each newsprint sheet, which you can marble on or leave blank. All materials will be pre-alummed for you so all you have to do is show up and marble! If you are interested in this special event, you must sign up by Tuesday, November 12 so I can ensure I have enough materials on hand. The regular 48-hour cancellation policy applies. And of course, the studio will be available for regular marbling as well (all tank sizes). As a reminder, Open Studio is available to former and current students or anyone with prior marbling experience. For more information, such as tank size options and pricing, click here. To sign up, send me an email (Cheers "at" BarbSkoog "dot" com) with the date, time frame, and tank size you want to work in (if not doing the wrapping paper event). As always, I welcome the chance to have students join me for Open Studio! The next one will be held Saturday, September 14 and Sunday, September 15 from 9 a.m. to 5 p.m. 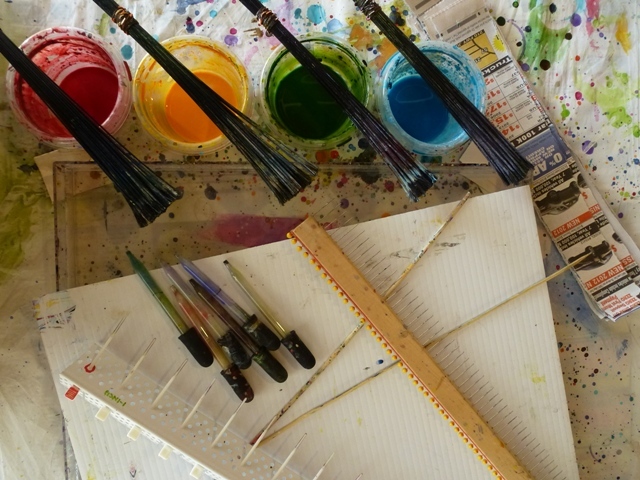 Available to former and current students or anyone with prior marbling experience, Open Studio is great for those who want to continue to practice marbling but who may not have the space to set up their own studio. Or maybe you want to test out a new tank size! I'll have the large tanks (20"x25") available as well as the half tank (15"x19"), medium tanks (11"x14"), and the small tank (5"x7"). While I don't teach during this time, I am in the studio to answer any questions. For more information about Open Studio, click here. To sign up, send me an email (Cheers "at" BarbSkoog "dot" com) with the date(s), time frame, and tank size you want to work in. Looking forward to seeing you!